With google dropping support for our style of blog we had to move the blog. The old entries will stay here but the new entries can be found at http://darkcompanyca.blogspot.com. 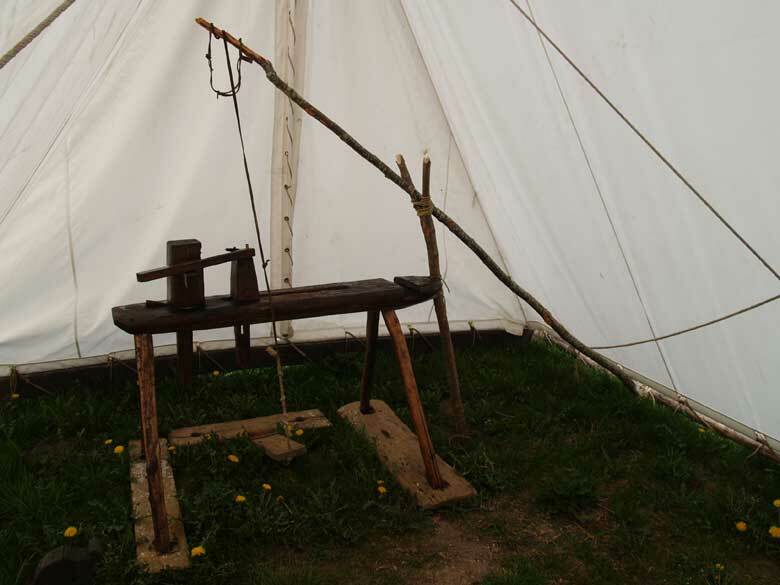 This is the set up used at the Ribe Viking Centre. You see that the sapling is tied off to one of the tent frame beams (the side beam in this case). The mid section of the pole is supported on a forked branch. (I would think using two of these would be even more stable. The lathe is set along the axis of the rear wall. This specific tent does open at both ends. I'm not sure in demo if the worker just has his back to the public. They also might open BOTH ends of the tent. DARC does Forward Into the Past again!